Do you want to process more and better geospatial data faster? Come to Leuven on May 23. Be smarter in handling your geospatial data? Process more and better data faster? The geo experts at GIM will help you with solutions that suit your organisation down to the ground. The earth observation team at GIM selects, processes, analyses and interprets images from a wide range of partners and translates them into useful insights for your activities. You can learn from our customers. The FME World Tour event takes place on Thursday 23rd of May 2019 in Ubicenter, Leuven. Like last year, there will be one big event for the entire Belgian FME community. Like previous years, we will be organizing a special introduction session for those not (yet) familiar to FME. Warning: using FME is addictive! With the support of GIM, the railway network manager is creating an intelligent database in which information about the railway infrastructure is uniform and up-to-date. 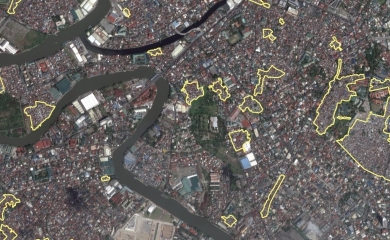 On behalf of the World Bank - the world's largest financial institution for development cooperation - GIM has made an inventory of all 2500 slums in Manila for the very first time. Become part of the GIM story?